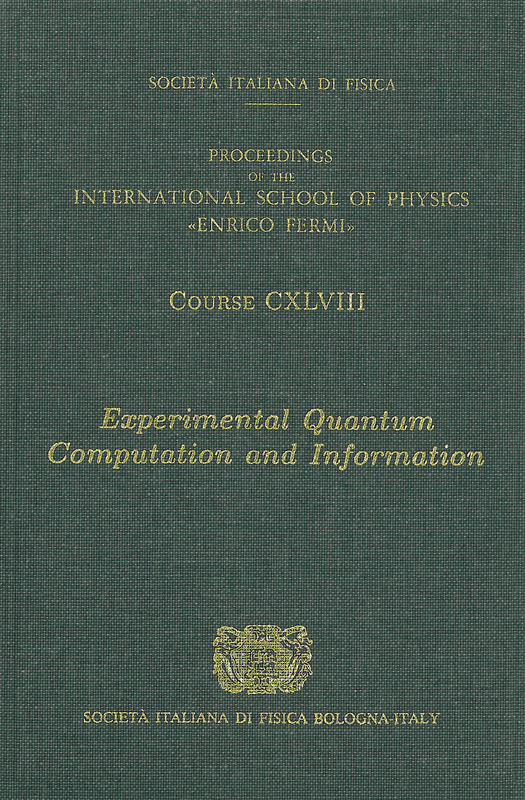 De Martini, F., Monroe, C.
148 of Proceedings of the International School of Physics "Enrico Fermi"
This Fermi Summer School of Physics on "Experimental Quantum Information and Computing" represents a primer on one of the most intriguing and rapidly expanding new areas of physics. In this part, the interest in quantum information (QI) science is due to the discovery that a computer operating on quantum mechanical principles can solve certain important computational problems exponentially faster than any conceivable classical computer. But this interest is also due to the interdisciplinary nature of the field: the rapid growth is attributable, in part, to the stimulating confluence of researchers and ideas from physics, chemistry, mathematics, information theory, and computer science. Physics plays a paramount role in QI science, as we realize that computing is itself a physical process subject to physical laws. The incredible growth of classical computers and information processors in the 20th century stems from Turing's notion that a computer is independent of the physical device actually being used; be they relays, vacuum tubes, or semiconductor transistors. As we strive to build useful quantum information processors into the 21st century, we thus look for any physical system that obeys the laws of quantum mechanics, from single photons and atoms to quantum superconducting devices. These Fermi lectures take us on a journey through these and other promising current experimental candidates for QI processing, spanning quantum optics and laser physics, atomic and molecular physics, physical chemistry, and condensed-matter physics. While this broad coverage of experimental physics represents a challenge to the student, such an appreciation of these fields will be critical in the future success of quantum technology. Indeed, the most exciting feature of QI science is that the technology ultimately leading to a quantum processor is likely presently unknown.